Based in Fort William, in the shadow of the mighty Ben Nevis, this year’s adventure is the best rail journeys in the Scottish Highlands. The Jacobite rail journey from Fort William, through the Highlands onto Mallaig is described as one of the greatest in the world. Coupled with this is the stunning train journey from the Kyle of Lochalsh to Dingwall and the chance to spot “Nessie” from the banks of Loch Ness. All in all this extremely popular holiday offers the most amazing scenery the Scottish Highlands has to offer. 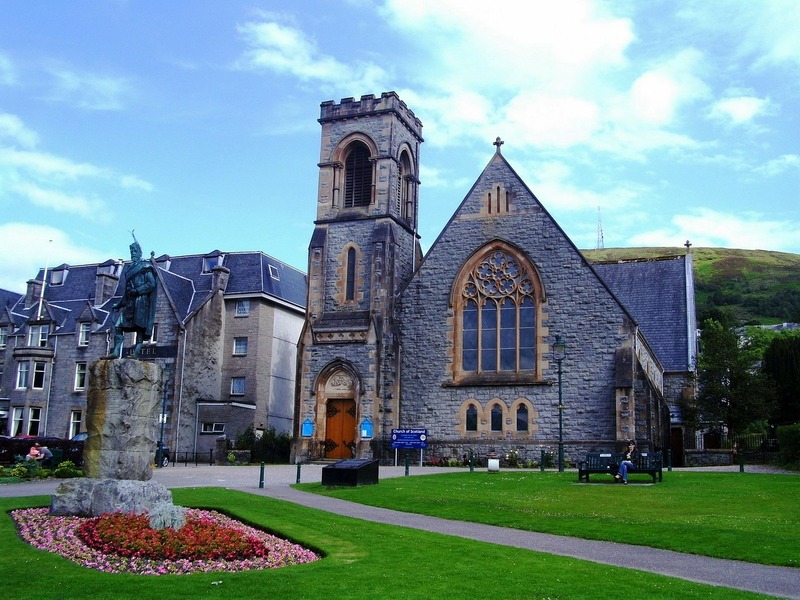 The Alexandra Hotel offers a traditional Scottish Highland warm welcome in the heart of Fort William, close to shops and other amenities. Located in the foothills of the mighty Ben Nevis Mountain, the Alexandra has 93 comfortable, modern bedrooms all benefiting from en-suite bathrooms, telephone, television and tea/coffee making facilities. Day 1 – We travel to our overnight stop with suitable and interesting stops along the way. Day 2 – Further north we go as we head into Scotland and to Stirling Castle, its then onto Callander at lunchtime. A couple of hours of ever changing glens and munro’s brings us to Fort William for the next 5 nights. Day 3 – The Jacobite from Fort William to Mallaig is said to be the World’s Greatest Railway Journey with 42 miles behind a classic steam train passing over Glenfinnan Viaduct, with brief stops at Scotland’s most westerly station, Scotland’s deepest Loch and shortest river allowing us time in Mallaig. Day 4 – Even more spectacular scenery today including Mam Ratagan (weather permitting) and views across to the Fiver Sisters of Kintail which takes us to the Kyle of Lochalsh for our trip by diesel train on the Kyle Line, a railway which took 27 years to build and is 80 miles long. On reaching Dingwall we have time ti stretch our legs before returning to Fort William aldon the banks of Loch Ness. Day 5 – Strathspey Steam Railway operates from Aviemore via Boat of Garten to Broomhill which you may know as Glenbogle from BBC’s Monarch of the Glen, our train ride today includes a light lunch served en route. Day 6 – It’s not all on the rails through as a whole day is spent around Fort William with the chance to take a cable car up AonachMor (price not included), sensational views on a clear day just over half way up Ben Nevis, Clan Cameron Museum, Neptunes Staircase and Spean Bridge. Day 7 – Today we head back over Glen Coe but this time along the banks of Loch Lomond to Luss and Gretna Green to our overnight hotel in the far north of England. Day 8 – Saturday, continue home with suitable refreshment stops along the way. Perth is steeped in history. Sitting astride the “Silver River Tay”, famous worldwide for its salmon fishing and its water as an essential ingredient of fine whiskies. The Edinburgh Tattoo is in its 68th year. Since the first Tattoo in 1950 more than 14 million people have attended with an annual audience of around 220,000. The oldest established hotel in Scotland, the Salutation has been welcoming guests through its doors since 1699. One of the most famous guests to sample the hospitality was Bonnie Prince Charlie who stayed in 1745, at the height if his struggle to regain the throne for the Stuart Kings. The welcome now is as warm as it ever was. ‘The Sally’ as it is affectionately know, offers tradition hospitality with all modern comforts in its 84 bedrooms all with en-suite facilities. All bedrooms have flat screen televisions, refreshments tray and direct dial telephones. The hotel has a lift to all floors. Day 1 – We head to our overnight hotel in the north east of England with comfort stops en route. Day 2 – after breakfast we head up to the borders and spend lunchtime in Berwick Upon Tweed, arriving in Perth late afternoon. Day 3 – a wonderful scenic day exploring Tayside, firstly we visit Pitlochry before driving to the Queens View, a stunning view of Loch Tummel before driving along the Loch then onto Aberfeldy. Day 4 – At lunchtime we head to Edinburgh where we take a guided tour of the city, after free time for a meal (not included) we then head to the Castle for the highlight of the tour, the Edinburgh Tattoo. Day 5 – After our late night we have free time in Perth before setting off after lunch for the beautiful town of Dundee, on the banks of the River Tay. Day 6 – Early breakfast and head south towards home with comfort stops en route arriving back early evening.